The food we eat has a tremendous effect on our health. Modifying the diet as per the ongoing disease plays an important role in controlling and treating the ailment. This is also true with psoriasis. The eminent dietary modification for psoriasis is a gluten free diet. ‘Gluten' is a storage protein found in wheat, rye and barley. Few people have antibodies to a component of gluten, called ‘gliadin' which can result in a condition called celiac disease. When these people consume gluten containing foods it can cause gastrointestinal disorders or pustule break out. Studies and research have shown that most of the people with psoriasis have anti-gliadin antibodies. Adoption of a gluten free diet has shown relief in such people. It is also important to know that every individual with psoriasis does not have anti gliadin antibodies and for these people following a gluten free diet would not be of any benefit. Lot of ‘suggestive' dietary studies were conducted to find out the benefits of including fish oil to reduce the onset and flaring up of psoriasis. But unfortunately, most psoriatic patients did not get relief on their skin from the use of fish oil or omega-3 supplements. Slight benefits were seen by adopting healthy eating habits such as including fresh fruits, vegetables, small amount of proteins from fish, milk products and olive oil. Avoiding processed foods, red meats and refined carbohydrates has proved to reduce the irritation of psoriatic skin. Intake of carrot, tomatoes and fresh fruits has been associated with reduction in symptoms. • Bathing is another important self care essential for psoriasis: Avoid hot water which can irritate the skin. Instead, use luke warm water. Pat dry and apply moisturizer immediately. • Phototherapy with UV light is a proven treatment for psoriasis. You can cover unaffected skin with SPF30 and expose to limited sunlight. Fifteen minutes for three days a week would be a good start. 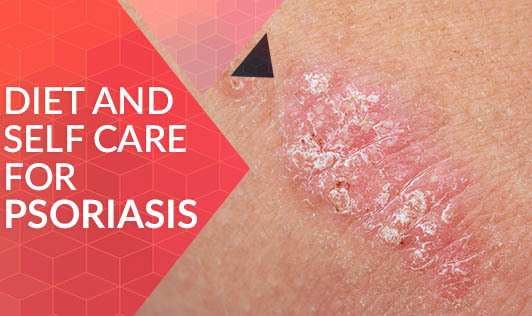 Since psoriatic skin is highly sensitive, it is always better to consult your doctor before trying anything new all by yourself. • Considerate diet changes: There is no proper evidence of any food making psoriasis worse or better. Many people with psoriasis have claimed betterment after avoiding certain foods, like spicy foods, sugars, white flour, caffeine and other processed foods. It is wise to experiment by eliminating certain foods that cause skin irritation, especially junk and less nutritious foods. You would be a better judge of foods that you should avoid for the better. . It is also very important to maintain a healthy weight by eating a healthy diet rich in fruits and vegetables. • Comfort cotton clothing is a better choice for psoriatic people as the chances of irritation is less and loose clothing promotes better air circulation. As a precautionary measure, whenever you want to try anything new, be it a new skin care product or over the counter medicines, inform your dermatologist and go as per his instruction.